One of the traditional Lenten practices is self-denial. Often this leaves us asking the question, “What should I give up for Lent?” The answers vary – candy, bread, wine, shopping, blogging…. We endure, for God’s sake, forty days of self-denial. We give up some ordinary thing or activity and with the celebration of Easter we reward ourselves with whatever thing or activity we had given up. How then has our life changed? It is almost as if our self-denial was just a period of time out. Children are sometimes put in time out when they have misbehaved. They are separated from their friends, toys, and usual activities – sitting on their bed or in the corner. After a short period of time they resume their normal activities. Surely Lent is more than the Church’s version of time out. 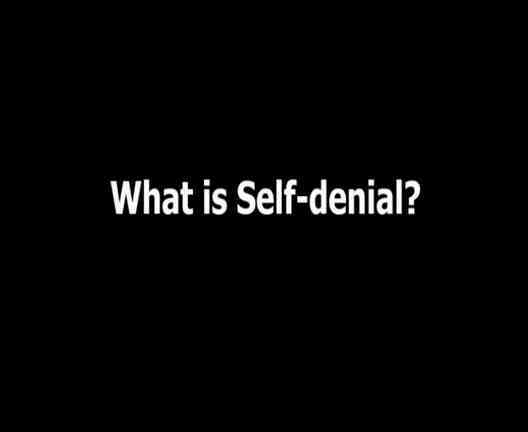 The risk of self-denial is that it becomes self-centered. Lent then becomes very small and focuses on my fasting, my giving up, my self-denial. Pretty soon we forget that our individual journeys always take place in the context of community. My growth and transformation, in order to be real and transformative, must necessarily affect and be connected to others. Self-denial is not the goal or object of our Lenten journey. God is. Self-denial does not gain for us God’s approval. God does not necessarily need or want our Lenten disciplines. God wants us. Self-denial asks us to look at and let go of the things, fears, attitudes, thinking, behaviors, accomplishments, successes, and failures that we think tell us who we are. This is not just for a season but for a lifetime. Lent is an interior journey, the way by which we again discover and live into our true identity. The practice of self-denial helps us discover and re-learn that who we are is who we are in God; and who we are in God is a beloved son or daughter. This is the way in which we and our relationships are restored to their original beauty and holiness. I remember speaking with my spiritual director many years ago about what I should give up or do for Lent. I offered him my list of ideas. He said no to all of them – no fasting, no reading, no theological thinking, no journal writing. Don’t even say your prayers he told me. He asked me to just show up – to simply be present and listen. He did not call it self-denial but it was. I was to deny myself the need to be productive and busy. I was to let go of my need for answers and the safety of rational thought. I was to trust the silence. I would have to let go of being in control. Lent would not be done according to my list or agenda. Rather than getting through Lent I was to let Lent get through to me. That year every place of self-denial became an entry point for the risen Christ. Self-denial, which is so often mentioned in connection with the practice of Christianity, is conceived by some as an end in itself; they look upon it as the essential point of every Christian’s life. But it is only a way and a means for achieving our end – the putting on of Christ. Neither must we think, as others do – going to the opposite extreme – that self-denial means renouncing one’s personality, one’s own path, a sort of spiritual suicide. Quite the contrary: self-denial is liberation from the slavery of sin (without self-denial we are prisoners), and the free manifestation of our true essence as originally designed for us by God. Originally posted on Reflections Online. Thank you Sr. Dorcee. Seems to me that self-denial is really just saying “yes” to God. I had this great suspicion that this whole life with God is really about saying Yes. Yes to God. Yes to who God truly created us to be. Yes to loving others. Yes to trust. Yes to vulnerability. The Great Yes…thinking all along it is a denial…when it really is fulfillment. Thanks for this post. Katie, I like the way you think. The answer can only ever really be “yes.” Our “yes” echoes and responds to God’s prior “yes” to us. Yes. It is too easy to look at me and not God within and without. Thank you for your homily at Rick and Debbie’s wedding. My husband and I were touched in our hearts and wondered if we even listened to our priest when we were married 41 years ago??? Thank you Jan. I appreciate your kind words. It was a great evening and privilege to be there. I think self-denial helps us remember that God is the lens through which we are to see the world, each other, and ourselves. It’s funny how we humans are, that we can even turn self-denial into self-glorification! We’re always looking for an extra brownie button. Thanks for this message. I think you have identified one of our wounded places. We forget that our glorification has already happened in Christ so we try to do it for ourselves. That’s powerful,word of the old.